I first had Pozole when I was living in New York on the edge of Spanish Harlem. A friend took me to a tiny Mexican restaurant that served the soup every Friday. It was a steaming bowl of broth, slow-cooked pork, and hominy served with onion, cilantro, lime, avocado, radishes, and hot sauce on the side (imagine Mexican Pho). It was instantly my favorite soup. Later, when I was turning all the foods I loved into soups for work, I developed a recipe that didn't have everything on the side so that it would be easier to serve. I've often said that this is the best recipe I've ever developed myself (maybe the best-tasting dish I know how to make), but I was never sure if I should really call it Pozole. 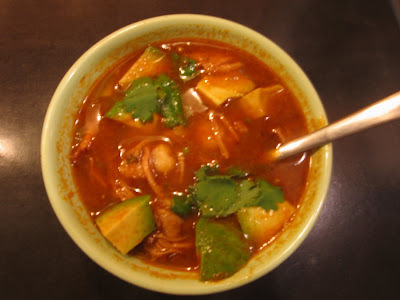 The first time I ordered Pozole in Mexico I was sure I needed to come up with a different name for mine because it was, again, had a delicious clear broth with all the fixins on the side - not so much like the thick, red stew I make. But then, wait, I ordered it somewhere else on another visit and what came to the table might have come from my own kitchen! I made John try it to confirm I wasn't giving in to wishful thinking. I discovered that I make Pozole Rojo. Hurray! I make this in my slow cooker so that I can have it on a weekday, but you can make it on the stove top if you're going to be home for a few hours to stir. Heat a little oil in a large saute pan (or the bottom of your soup pot) to nice and hot, but not smoking. 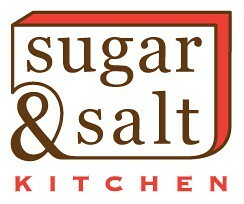 Sprinkle one side of the pork with salt & pepper and put this side down in the pan. Sprinkle the other side now. Sear the meat for about 5 minutes per side (until it's all nicely browned, but don't worry about cooking it through) and then transfer it to the slow cooker. In that same pan, saute the onions and garlic (you're going to puree later, so don't waste time with careful chopping) until the edges are starting to brown. Sprinkle the onions and garlic with the cumin and cinnamon. Have the cans of tomatoes open and ready while you toast the spices until you're worried they're sticking. Dump in the tomatoes, green chilies and the rest of the spices. Stir well to get all the good bits off the pan. Remove the seeds and stem from the ancho and tear it into pieces before adding it to the rest. Anchos are not very spicy, so you may want to sprinkle in some cayenne here if you want a spicier soup. Put all of this in the slow cooker along with 8 cups of the stock, cilantro (reserve a little for garnish later), and the juice of two and a half limes. Cook on high for 4 hours (about 2 hours on the stove top - until the meat is falling apart). Remove the meat and the bay leaf. Blend what's left in the cooker until it is smooth (using an immersion blender or in batches in a regular blender). Break the pork up into bite-sized pieces. Add it back into the soup along with the hominy. Add more stock until it is the consistency you like. Cover and cook on high for another 2 hours. My slow cooker is small so I actually have to switch to the stove top at this step, stirring more frequently. Serve the soup with chopped cilantro, a wedge of lime, and cubes of avocado. 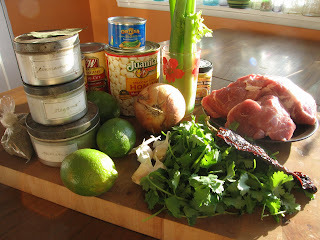 * I don't make many recipes with "specialty ingredients," but Pozole is one of them. 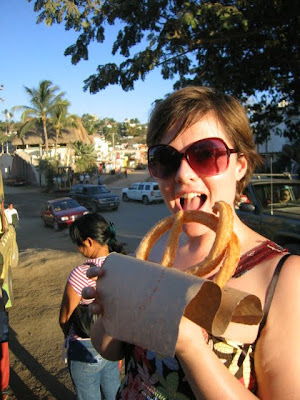 It just isn't the same without the ancho chili (dried poblano). They're in many of the grocery stores in Seattle, or online. If you really can't find them, try substituting (maybe roasted peppers and jalapenos?) and let me know how it goes.